SFI offers shielded enclosures as small as 24"x 24" 24" to fit your tabletop testing needs. The rapidly evolving wireless electronics market involves testing for device compatibility. This phase now includes testing with devices that control or monitor a multitude of “things” or the IOT. Testing for device compatibility at 600 MHz to 6 GHz can result in the need for a specialized RF isolation enclosure. that meets specific size dimensions and shapes. These RF shielding isolation enclosures need to be compact, portable and easy to store. A Wi-Fi systems manufacturer is using a wire shelf rack system to qualify test devices and needed an RF isolation enclosure that both fits on the rack and contains the test setup. 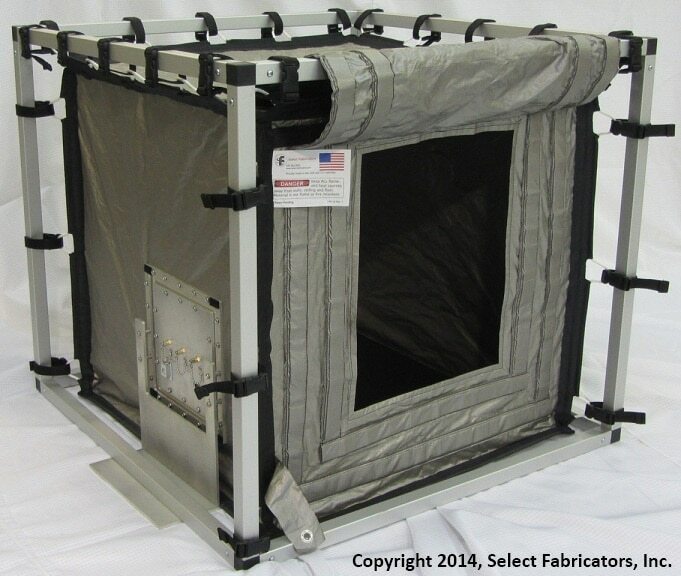 They envisioned a custom-sized fabric enclosure and contacted Select Fabricators, Inc. An appropriate sized test enclosure was designed including the manufacturer’s requirements for ventilation and filtering. A single door with double magnets (US No. 8,530,756) allowed easy access to the test equipment and fixtures. Result: The resulting RF enclosure system successfully improved testing. They now use several custom-sized conductive fabric enclosures to widen their testing capabilities. RoHS compliant, durable, conductive silver/ copper/nickel fabric may be specifically designed to any size or shape of EM/RF “faraday cage” type enclosure to enable the placement of devices in relation to testing needs. I/O plates and filters, similar to the backplane of hard wall enclosures, are configured with customer specified connectors. A wireless semiconductor manufacturer uses a robotic EMI sensing tool in their radio-frequency systems’ research and development phase. Stray RF signals in the lab prevented the developers from seeing problem areas near the noise floor of the analyzer. This American semiconductor company contacted Select Fabricators, Inc. for a possible solution to enclose the testing equipment and provide high attenuation. 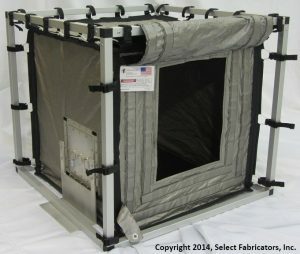 SFi designed a custom sized tent based on the test equipment’s footprint and included high attenuation power and data filters. The resulting design provides better than 90 dB isolation in the frequency range of 600 MHz to 6 GHz. Result: The custom sized tabletop enclosure provides enough suppression that the R & D team can see the relevant RFI in the analyzer’s noise flow. The Internet of Things is beginning to ramp up the prototyping of devices that need to be compatible with each other. Everything from refrigerators to home security to driverless cars – these all need to be able to talk to each other. Using a custom-sized, portable, RF isolation enclosure can help assist a quicker time to market. Please contact one of our engineers if you would like to learn more about our tabletop RF shielding enclosures.